There are different kinds of statement examples that you can come up with and one of these is a legal statement. In terms of document writing; a legal statement should be precise, specific and easy to understand. For this document to be effective and usable, you have to ensure that you will use a non-argumentative way of giving out information. Writing a legal statement will vary on the objective of its creation or the reason why you need to use one. As a legal document, a legal statement should not include fabrication of information. More so, it should not exaggerate things that have happened just for the person who wrote it to benefit even more as it can cause backfire when opposed accordingly. If you do not know how to come up with a legally acceptable statement, you may start gathering more information about the matter by referring to the information present in this post. What is a Legal Statement? A legal statement can be used for different legal purposes which may include judgment on a court or accounting a witness for the information that he or she has given. A legal statement is a written document which can be essential to a wide range of legal cases. A legal statement is used to accurately depict a situation through the information given by the person to whom the legal statement belongs. 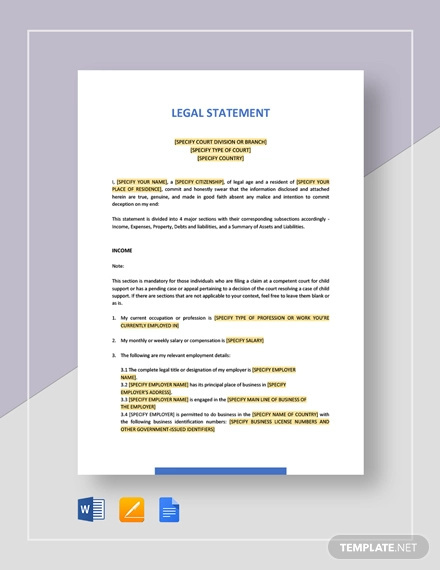 A legal statement is a document which allows the point of view of the person who made it more understandable, believable and compelling to the general public. A legal statement is practically a legal document which is considered to be valid by law which governs the location where the case is undergoing. A legal statement can be in the form of a witness statement which is a written document including the confession of a person to a legal body or entity. First, you have to be aware of the purpose of the legal statement. Determining the results that you would like to achieve can help you construct an effective legal statement that will work to your advantage. Be aware of the specific activity where you will use the legal statement. This way, your legal statement can precisely identify the details that are necessary to help you to attain the result that you would like to gain. It is important for you to specify the date when the legal statement has been formulated. Place this on top of the document so that legal entities who will review the legal statement can be aware of its date of creation. Specify the legal statement’s subject so that people can be knowledgeable about what the document is specifically for. Include the location where the legal statement has been made. Identify the information flow that you will pattern the content of the legal statement in. This should be based on the need of the party who will be using the legal statement. List down all the facts that can be helpful for the case. As much as possible, do not include unreliable information, recommendations, and opinions. It is important for you to clearly identify the details pertaining to the parties involved or specified in the statement. Be precise with their involvement in the process. As much as possible, break down the details that you would like to discuss. The more related information it is that you can provide, the better. Review your statements with regards to the legal issue. Assess whether these statements are strong enough to be used. Depending on the statements that you have provided, attach the documents which you think can be solid pieces of evidence that you have specified in your legal statement are accurate and true. Place your signature in the document as well as the signatures of the parties involved in the statement discussion. One of the most important things that you have to remember is to ensure that the way you create the statement is legally acceptable and correct. Hence, it will be best if you will seek professional help. Develop a legal statement in a way that you can fulfill the purpose of having the legal statement at hand. Ensure that you will list down all the legal facts in the statement so that the issue can be addressed accordingly. Since a legal statement will be used for legal activities, it is essential for you to make sure that there will be no lies in the legal statement that you will create. If applicable, incorporate terms and conditions for penalties discussion. As much as possible, the facts that you will include in your statement should benefit your party and not the opposition. It may be hard and intimidating to create a legal statement but this should not hinder you from creating one especially if it is necessary to be created for your advantage. With the information that we have provided, we hope that we have helped you to come up with a legal statement that works. Again, it is essential for you to seek professional help and legal advice when making a legal statement. Doing this can ensure your party that the items included in the statement are appropriate to be used, professionally formatted, and legally laid out.